Thermo King’s next-generation APU provides virtually unlimited heating and cooling while putting a premium on efficiency and user productivity. Its performance is uncompromised. The operational savings are real. 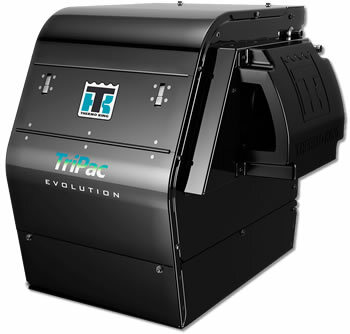 With virtually unlimited heating and cooling and a new control system to accurately diagnose issues, the TriPac Evolution’s performance is industry-leading. The control system is flash- loadable and includes a data logger. Diagnostics are improved with 22 alarm codes, and the charging system has been enhanced with amperage-based decision making. The new system gives flexibility to users, allowing customers’ to focus on fuel consumption, driver comfort or battery life to enhance their needs as appropriate. TriPac™ Evolution allows customers to focus on fuel consumption, driver comfort and battery life—it’s all driven by your needs. Easier access to components and the longest maintenace interval in the industry help keep costs down and your fleet moving. New three-knob design aligns closer to automotive architecture, making complicated training sessions a thing of the past. Thermo King is the only APU manufacturer to offer 24/7 service through its world class dealer network. Less time in maintenance means more time on the road. The TK Monitor gives technicians quick access to system information and allows for hassle-free diagnostics and software upgrades. Easily navigate the confusing variety of regulations on engine idling with the unit that eliminates emissions and meets all anti-idle requirements nationwide. For more information use the form below or call 336-855-7756.